AP: Your piece for Who Are We? is called ‘Searching for Great Aunt Minna’. How would you describe the piece? And who is Great Aunt Minna? JE: Great Aunt Minna was the sister of my grandfather. I didn’t know of her existence until I was about 40 years of age, and when she came up it was an enormous surprise. There was a strand of the family that had got separated due to war and religious persecution. Minna’s three brothers had gone south to South Africa and had settled there. Minna and her parents were thrown out of their family house in Latvia and had been sent to what was then called the “pale of settlement”, and they had to find their way to somewhere where they could settle with a little cart with the few possessions that they could take within a 24 hour period that they were given to leave their home. Now if I think about people having to flee their homes in Syria, Iraq and Afghanistan today, the project takes on an even more special place in my heart. When you’re sent packing not of your own choosing – what does that feel like? That is what really struck me. It struck me the minute I discovered her very existence. AP: When did you realise that this is a topic that you wanted to follow up? JE: As soon as I discovered that Minna had existed. There was also a very peculiar merging of stories. I had finished my book Truth and Lies about the Truth and Reconciliation Commission in South Africa. I was then commissioned by the Sunday Times to do a story about the traditional healers called Sangoma near the Lesotho-South African border. They are healers and they are literally called by their ancestors. One of the Sangomas said to me ‘your ancestors are in conflict’. So there was this odd thing roundabout the same time I discovered that Minna had existed. The ancestors that I knew were more my mother’s side, I didn’t know my father’s side. My grandfather and my grandmother on my father’s side had died before I was born and my father never talked about their history. When I discovered that Minna was a fact of life, I immediately wanted to go and find out what had happened. Around the same time I also discovered the existence of Minna’s grandson Victor. When I heard about him, I sent him an email and that’s how the story began. AP: How was it for you to encounter and reconnect with your family members in Ukraine? JE: All the time through I was trying to find similarities. Is there anything in the voice, in the dynamism of the stature, their interests…? I suppose it was reassuring that I didn’t feel an enormous connection. I felt that there was literally this cultural divide. I grew up in South Africa, I now live in London. The concept of Eastern Europe was quite unfamiliar to me, so it felt unfamiliar, their tastes seemed naturally different. Yet, what I found was similar was a zest for living, a dynamism, a hospitality, a kind of gregarious “let’s grab life and go for it”. AP: In your book you say that your contact with the Sangomas raised important questions about belonging for yourself. I was wondering how important you think it is to know where one belongs? Do you have a better sense of where you belong now after your journey? JE: The question of belonging, is something you suddenly want to understand better as you get older. The journey has given me a sense of peace because I feel I’ve done almost all I can do to understand. I’ve pieced together a bit of this mystery. For me the story of our influences and how that came about is what we’re trying to make sense of all the time. Not only of what is going on around us, politically and socially but emotionally, too. We want to understand where we’re coming from, what our influences are. AP: You are a widely recognised as a photographer, your works have been exhibited internationally and you have received several awards including for your book Truth and Lies. How has your experience as a photographer shaped your approach? In what sense does this project build upon your earlier work, in what sense is it different? JE: The first trip I made to Ukraine I took a film camera. I wanted to film it and then I came back the BBC series “Who do you think you are?” had started. It both threw me and amused me because it happens to me a fair bit, that something I think of is somehow there in the zeitgeist. I thought perhaps I should have worked with a stills camera after all. When I started to work on the book I took mainly stills from the film, and when I went to Latvia I took a digital stills camera. The work was conceived as the hard copy of a book with these images being like visual diary pieces. Unlike my other work, where photographs are like statements, the book is predominantly text and uses these little visual references to endorse the story. 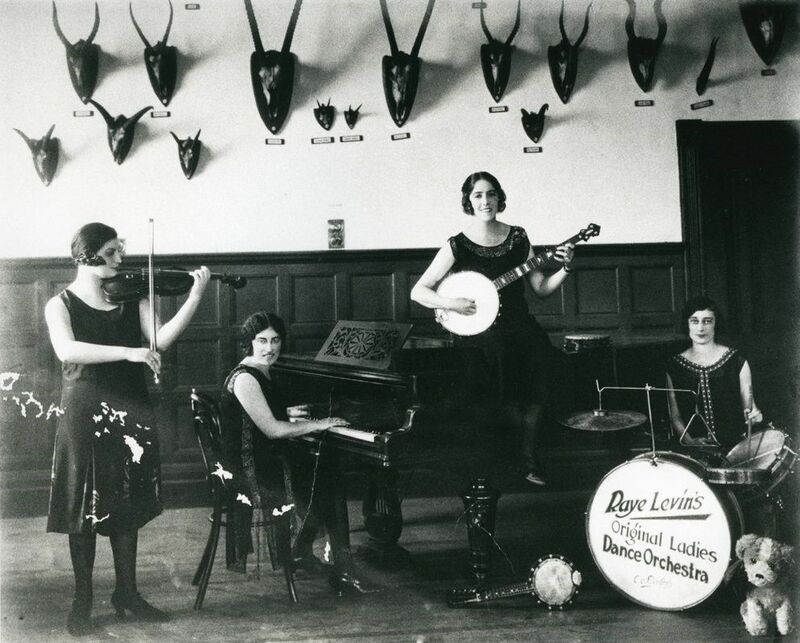 Jillian Edelstein’s great aunts Rosie (drums) and Raye Levin (piano), taken in Cape Town in the early 1930s, members of (as inscribed on the bass drum) Raye Levin’s Original Ladies Dance Orchestra. AP: What do you think are the challenges of doing a biographical project? JE: There are huge challenges. Most people are interested – certainly I am – in other people’s biographies. It’s a natural fact of being curious in the world. But I think in order for the work to translate, you have to bring it alive. There’s a thing about finding memory, you almost have to sit with it and it comes back to you. You have to allow that process to happen. That was hard but I’ve been rereading the text recently and I think it has worked. It’s is a merging of the biography and history, weaving that web of history, politics as well as the personal. AP: Finally I wanted to ask you a question about the wider implications for the project. We’re in a situation where the right to move, the crossing of borders, the right to mobility has become heavily politicised. And I was wondering what the story of your family can bring to these discussions of migration and displacement? What connections do you see? JE: I think it’s very pertinent. Firstly, it’s very pertinent for what is happening globally today with the rise of anti-semitism as well as with the move to the right in international politics. That and the conflict in the Middle East region. I think the world is in an enormous state of flux at the moment. Certainly when I was in Calais and Lesbos I felt that there were waves of people not staying still, moving because of war, conflict, persecution, drought and wanting to better their lives. In my family there was a situation when they were forced from their lives. Sassmacken in Latvia probably was a thriving community and then there’s an edict that everybody has to leave because they happen to be Jewish. One can’t image. So I’m hoping that the project serves that concept of ‘lest we forget’ and that we need to honour one another as human beings in life. I don’t know if this is too banal or twee as a story but it is a poignant story, a story of loss and separateness. AP: In that sense the project is also a quest for memory and a reminder of the histories of displacement, of anti-semitism, of forced mobility that people in Europe had to experience. JE: …and a lack of tolerance and lack of understanding. That yes, if we’re different, but we’re actually all the same. AP: Thank you very much, Jillian, for the interesting conversation! London-based photographer Jillian Edelstein began working as a press photographer in Johannesburg, South Africa. In 1985 she attended the London College of Printing. Her portraits have appeared in many publications including The New Yorker, The New York Times Magazine, The Financial Times Magazine, Vanity Fair and Interview. She has received several awards including the Kodak UK Young Photographer of the Year, Photographers’ Gallery Portrait Photographer of the Year Award 1990, the Visa d’Or at the International Festival of Photojournalism in Perpignan in 1997, the European Final Art Polaroid Award in 1999, the John Kobal Book Award 2003 and was included in The Taylor Wessing Portrait Award in 2014, the AI-AP Archive in 2008 and 2015. A winner in Latin American Fotografia 2015 and 2016, she has also been included in World Press Awards twice. Between 1996 and 2002 she returned to South Africa frequently to document the work of the Truth and Reconciliation Commission. Her award winning book Truth and Lies, shot in large format was published by Granta, the New Press and Mail and Guardian in 2002. Her photographs have been exhibited internationally at venues including the National Portrait Gallery, The Photographers’ Gallery, The Royal Academy, OXO Gallery, Tom Blau Gallery in London, the Rencontres Internationales de la Photographie in Arles, France, the Bensusan Museum, Johannesburg, Robben Island Museum in Cape Town, South Africa and Dali International Photography Festival, Yunnan Province, China. Alena Pfoser is Lecturer in Communication and Media Studies at Loughborough University. Her research focuses on borders, memory and cultural identity, using ethnographic and narrative methods.